This teenage edition of Funky Flute is designed to engage and excite teenagers when learning to play the flute. The Queen of cool Heather Hammond teaches young flautists everything they need to know, including how to read music and create a great sound. Teenage Funky Flute Student Book 1 by Heather Hammond was published by Kevin Mayhew in January 1900 and is our 9093rd best seller. The ISBN for Teenage Funky Flute Student Book 1 is 9781844178988. 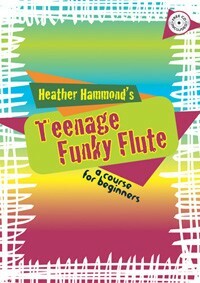 Be the first to review Teenage Funky Flute Student Book 1! Got a question? No problem! Just click here to ask us about Teenage Funky Flute Student Book 1. A:Yes this book has a free CD included.